I am a comedian and actress. Spend my time doing stand up comedy around London and the UK and I film bits and bobs for TV and film too like The Crown, Call the Midwife, Silent Witness and BBC comedies like Bucket and Sunny D.
I write articles and funnies for publications like The Guardian, Time Out, Huffington Post and Stylist. 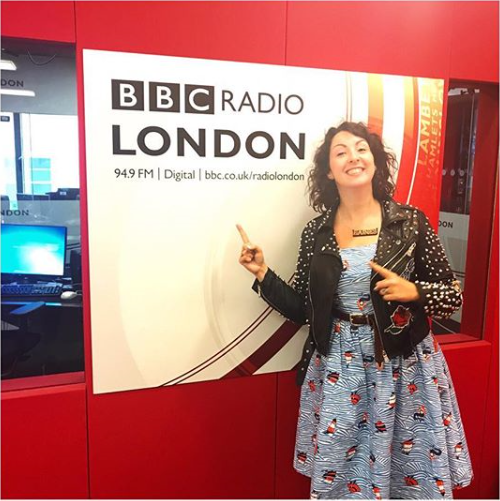 I also do radio, as I love having a good natter – I’m at BBC Radio London quite a bit covering the Saturday Breakfast Show and appearing on the lovely Gaby Roslin’s Show and I pop into other stations like BBC Radio 4, BBC Radio 2, Talk Radio and Virgin to talk comedy and news. If I am filming or doing a radio breakfast show its ridiculously early like 5am or 6am but when I am not doing those things its around 9am. Weetabix with almond milk and fruit on top, eaten in front of Lorraine or This Morning with a cup of Earl Grey tea. It’s usually a battle to see if I can eat breakfast it quickly enough – without my cat noticing because he loves drinking the milk out of the bowl when I am not watching. Myself mainly. Climate change? Well we all are. I am responsible for doing a good job and writing funny things I suppose, and not swearing on the radio! When John Lithgow said I was funny in rehearsals for The Crown and I said “can I use that on my poster?” and he laughed and I said “no seriously!” I’m so bad at playing it ‘cool’. I’ve also had some amazing emails from people who have come to see my stand up shows or have seen me do talks etc. which have been really touching and a few of those have been particularly memorable. … watching Love Island! Relaxing with my husband and friends. I love crafts and I have actually got into cross stitching recently! It’s very relaxing. Everything! I love clothes and shoes and jackets so I have a big wardrobe. I am really into my red Timberland boots, although during this heatwave I obviously haven’t been wearing them – it’s annoying when the weather gets in the way of outfit planning! I have some really cute 1950’s inspired dresses which I have been wearing to death recently so at the moment I probably couldn’t live without those. Oh and my leather jacket because it goes with everything! I think my spirit animal is probably a cat because I like lying in the sun and having food made for me (although I don’t enjoy pooing in a tray!) I have two cats called Victoria and Albert and I moult just as much as they do! My all time favourites are the Harry Potter books because I was obsessed with them when they came out and I don’t think I have ever read books so quickly. I love books that create a whole new world that you are drawn into. I also recently read The Watchmaker of Filigree Street by Natasha Pulley which is another magical story and The Snow Child by Eowyn Ivey is just wonderful – the imagery will stay with you long after you finish the book.